The Senior Worcestershire County Table Tennis Championships were held on Sunday 14th February 2016 at Pensnett Community School in Dudley. A slightly reduced entry saw 5 groups of 4 in the Mens Singles, with the top 3 in each group going through to the knockout stages. The only upset to the seedings came in Group 1 where the seeded player, Dave Rogers, could only finish in 3rd place in the group, with Craig Preece finishing top of the group. In the round of 16 the No 5 seed Mark Fiddian lost to Nigel Foreshew, while in the Quarter-Finals both Ben Bennett (No 2 Seed) and Tom Savary (No 4 Seed), failed to progress. This left Craig Preece to face Jamie Cartwright for a place in the Final with the other Semi between Svilen Andreev and Patrick Kowacz. Preece and Andreev both won in 4 ends and Svilen Andreev put his name on the Trophy for the first time, winning by 3 ends to 1. The Ladies, with only 3 entries was played as a round robin event with Yeh Tsz Yan winning both her matches, with Ann Barnes finishing as Runner-Up. The Mens Doubles was won by the No 2 seeded pairing of Jamie Cartwright and Tom Savary, from Dudley, beating the Malvern Pairing of Patrick Kowacz and Nigel Foreshew. In the Vets Singles Final Mark Fiddian reversed the earlier defeat by Nigel Foreshew to put his name on the Trophy. 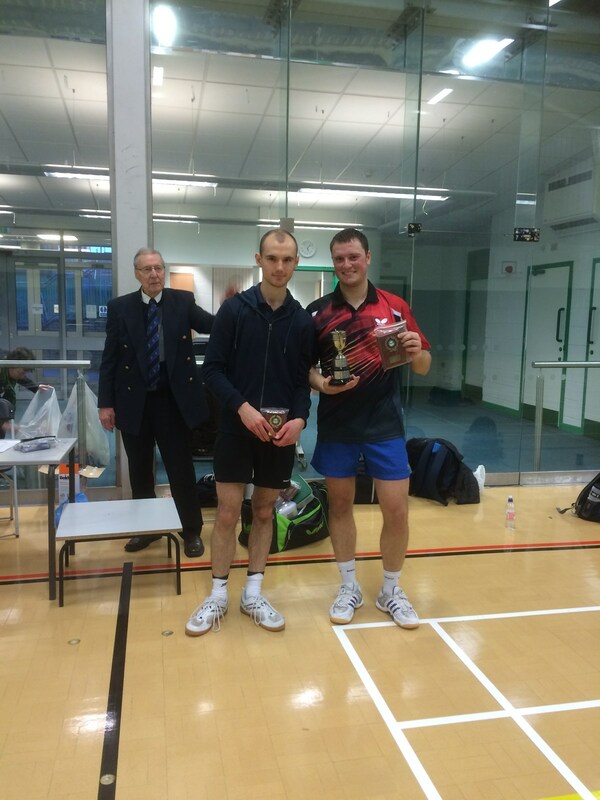 Mark Fiddian also won the round robin vets doubles with Dave Rogers, with Russell Duncan and Pete Canavan Runners-Up. In the round robin Under 21’s Singles Ben Bennett came out top of the group, with Yeh Tsz Yan Runner-Up. Thank you to Mark Nicholls and John Cheadle of the Bromley Table Tennis Club for providing the facilities on the day.